Our grooming table covers are 30" x 60" premium terry velour towels and are made of a 100% cotton, triple-sheared terry velour fabric. They include a 5.0" wide x 5.5" tall embroidered NBC 2017 Specialty Logo on one end. 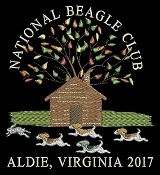 1) Add your kennel name for just $17.00. We will use arial rounded font and the thread color will match the thread color of the sand. The size of this design is 5.9" wide x 6.25" tall.